An unseen planet on the edge of our solar system, probably formed closer to home around the Sun than previously thought, astronomers say. Researchers led by the University of Sheffield in the UK found that Planet 9 is unlikely to have been captured from another planetary system, as has previously been suggested. The outskirts of the solar system have always been something of an enigma, with astronomers in the late 19th and early 20th centuries searching for a giant planet that was not there, and the subsequent discovery of Pluto in 1930. Pluto was downgraded in status to a dwarf planet because astronomers discovered many other small objects so-called Edgeworth-Kuiper Belt objects at similar distances from the Sun. Last year, astronomers working in the US postulated the presence of Planet 9 to explain the strange orbital properties of some Edgeworth-Kuiper Belt objects. However, while it is not possible to directly observe Planet 9, it has not stopped theorists from trying to work out how it got there. Planet 9 is at least ten times bigger than Earth, making it unlikely that it formed at such a large distance from the Sun. Instead, it has been suggested it either moved there from the inner regions of the Solar System, or it could have been captured when the Sun was still in its birth star cluster. Richard Parker from the University of Sheffield along with colleagues from ETH Zurich in Switzerland showed that the capture scenario is extremely unlikely. Researchers simulated the Suns stellar nursery where interactions are common and found that even in conditions optimised to capture free-floating planets, only five-to-10 out of 10,000 planets are captured onto an orbit like Planet 9s. 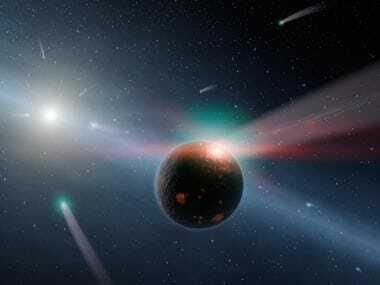 "We know that planetary systems form at the same time as stars, and when stars are very young they are usually found in groups where interactions between stellar siblings are common. "Therefore, the environment where stars form directly affects planetary systems like our own, and is usually so densely populated that stars can capture other stars or planets," said Parker. "In this work, we have shown that, although capture is common, ensnaring planets onto the postulated orbit of Planet 9 is very improbable. "We are not ruling out the idea of Planet 9, but instead we are saying that it must have formed around the Sun, rather than captured from another planetary system," he said. The study was published in the journal Royal Astronomical Society.